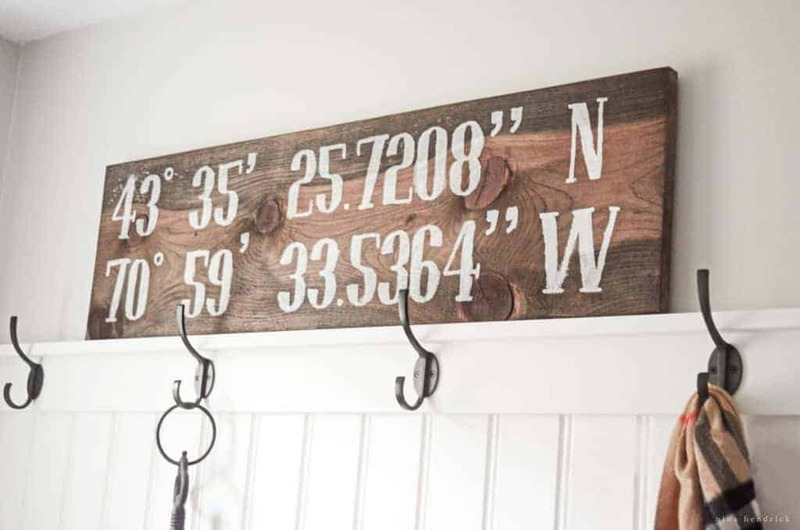 This quick and easy DIY Reclaimed Pine Coordinates Sign adds a rustic accent to any wall and can be completed in a single naptime! Hey, friends! Ready for a much overdue DIY? This project is quick and easy, which are definitely priorities since we welcomed our baby girl last month. Although things are obviously a lot different now, I still look around and feel the urge to complete projects, and our current project is our mudroom. 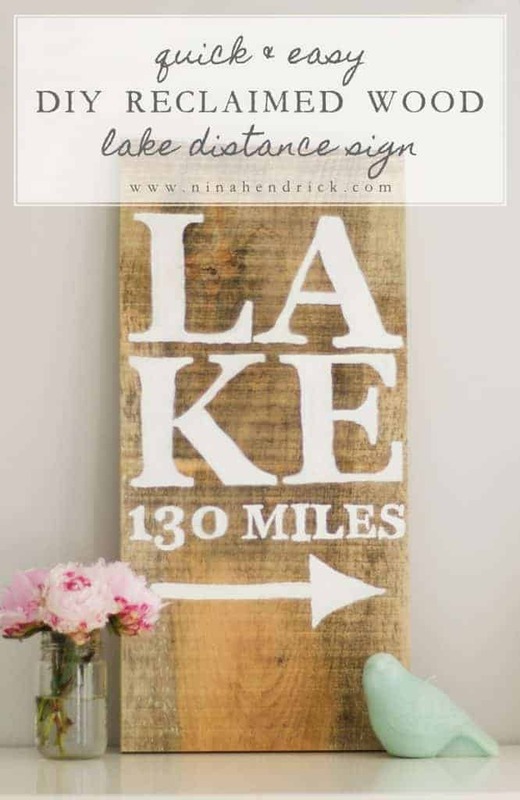 This easy DIY Reclaimed Pine Coordinates Sign can be completed in a single naptime which is perfect for life these days! It all began with a weathered 11.5 x 36″ board. 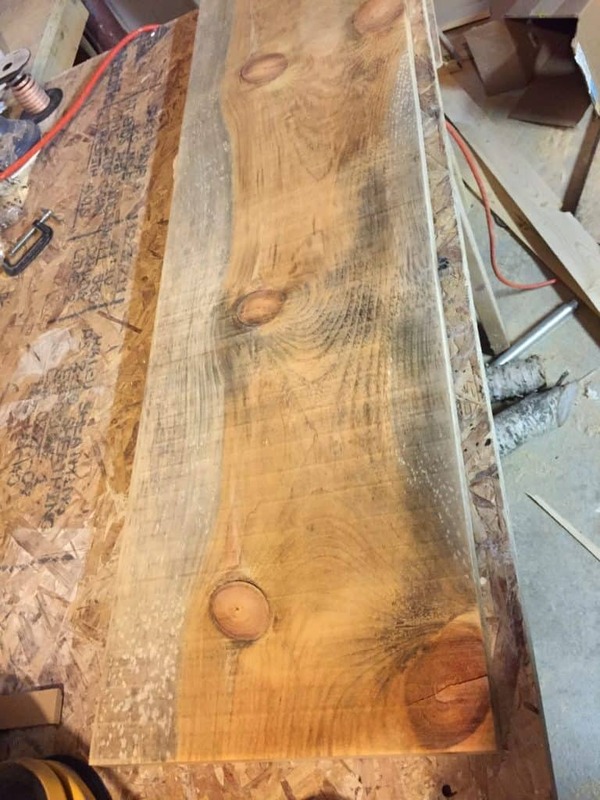 My dad is an arborist (tree guy) and has boards milled out from particularly nice trees. I like to “shop” his barn for pieces. I love the patina, saw marks, and character that rough cut wood always has. It isn’t truly old or “reclaimed”, but it has a lot of the same characteristics (and I know people are always looking for those buzzwords!). It’s also free for me… which really can’t be beat! To find a similar board, you can search for salvage yards or lumber yards that may be located close to you. Or you can improvise with a new board from a home improvement store and simply “weather it” to look old! My favorite method to weather boards is to either leave them outside for a long period of time, ideally in a way that I know they won’t warp. However, I know that method takes patience. You can also use a combination of stains, chains, hammers, etc to give the board a weather-beaten appearance. stain of choice- I used this one. thick chalk paint- I used this one. 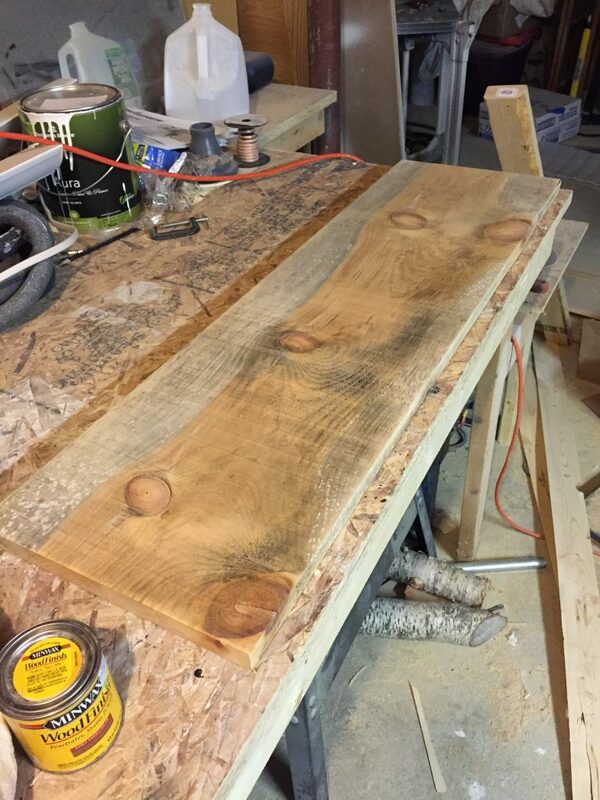 To begin my project, I lightly sanded the board down with 80-grit sandpaper. I didn’t want to remove too much of the saw marks or the patina. Next, I gave it a coat of stain- Early American by Minwax. It brought out the colors beautifully, but I admit to a certain amount of stain regret. The patina was so gorgeous- if I did this project again today, I would leave the wood natural. 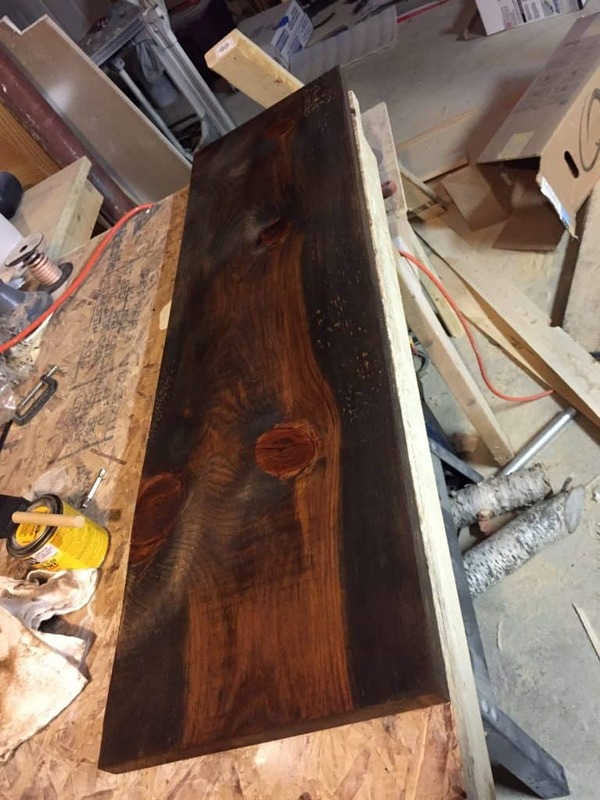 I wiped it away quickly because the wood was dry and thirsty and I didn’t want the board to be too dark. I didn’t have to wait long for it to dry- but if conditions are different for you, I would recommend splitting the project up into a couple of days. After the stain dried, next came the stenciling. 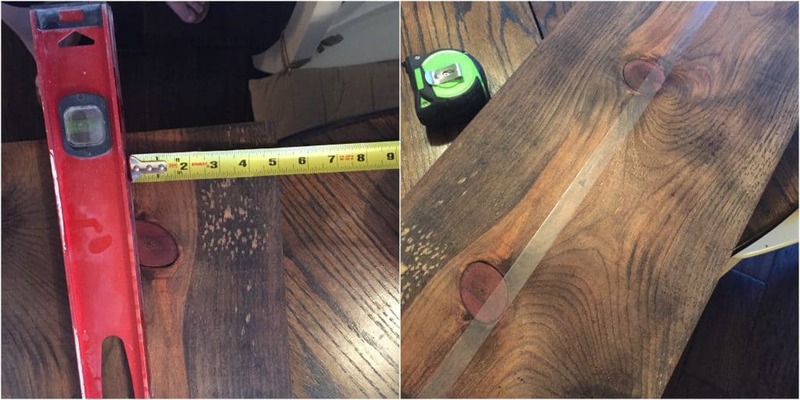 First I taped off a straight edge at 5″ from the top and another 5″ below that. I discovered I was out of painters tape during the project, but the scotch tape surprisingly worked out fine! Next, I found the longitude and latitude of our favorite vacation spot. I typed them into a photoshop document sized to US Letter, but you could also easily accomplish this in Microsoft Word. I used the free “Pottery Barn” font and sized it to 4″ tall- or 350 pts. As you can see, I tried to maximize paper usage. 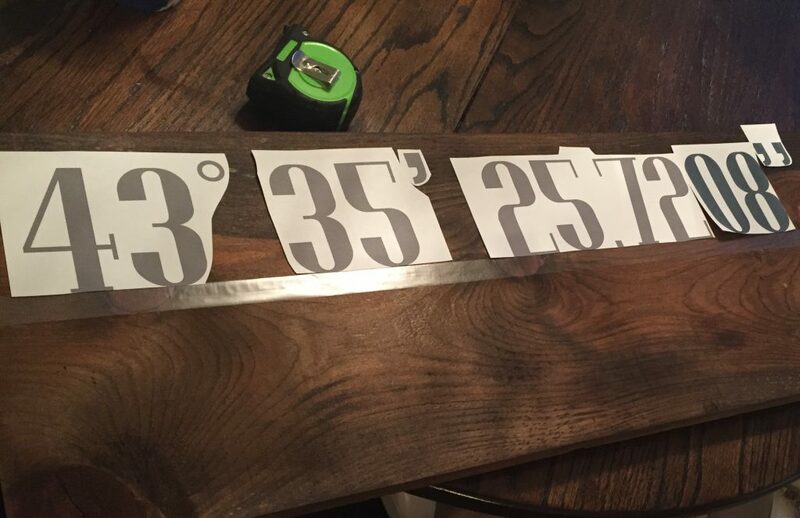 After printing, I cut out the pieces of the numbers and arranged them level and in order. The next step only really worked out because this was soft pine. 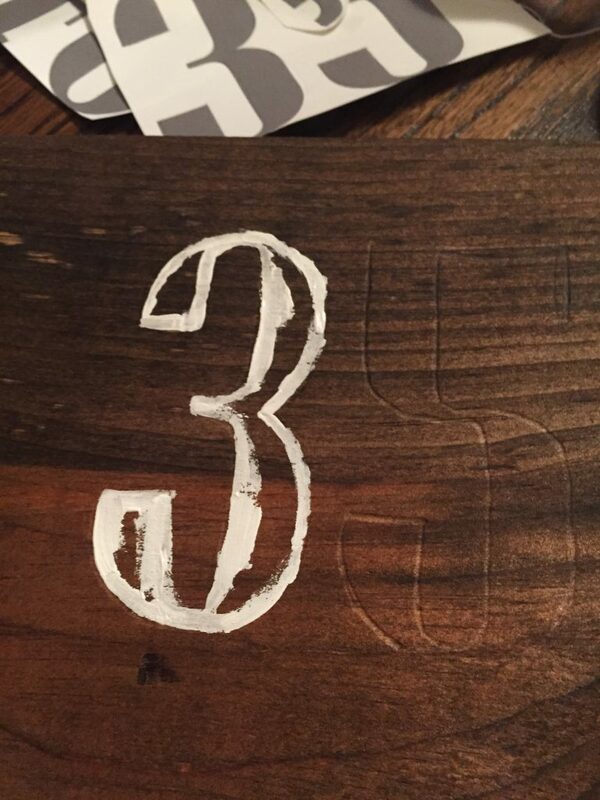 I outlined the numbers with a pencil, pressing down, which left an imprint of the number in the wood. The grain of the wood naturally pulled the pencil in certain directions, so it wasn’t precise. 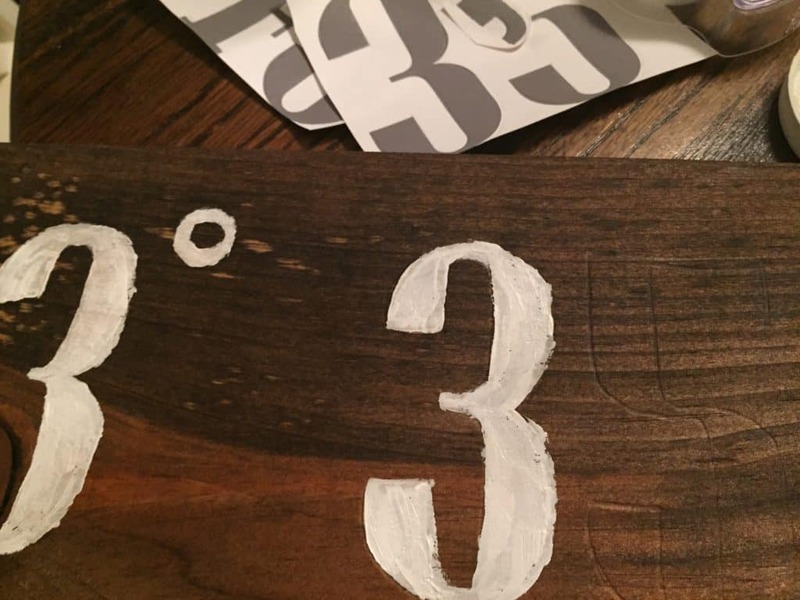 If you were using hardwood, you would have to cut out a stencil with a machine like a Cricut, or purchase number stencils. After I finished tracing and leaving imprints, I began to paint using some leftover white chalk paint. I chose this chalk paint because it’s thicker, and watery paint would have absorbed into the wood grain. Even the chalk paint absorbed quite a bit! I outlined the numbers first with my paintbrush, then went back and filled everything in. I was intentionally going for a rustic look, so I wasn’t too worried about making it perfect. 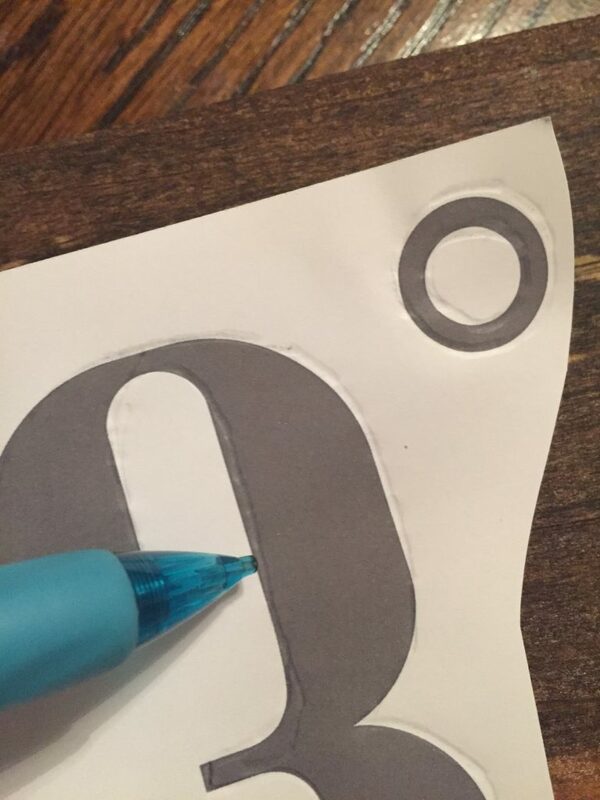 If you are a perfectionist it would be better to have a completely sanded board and a classic stencil. Here’s the finished product! 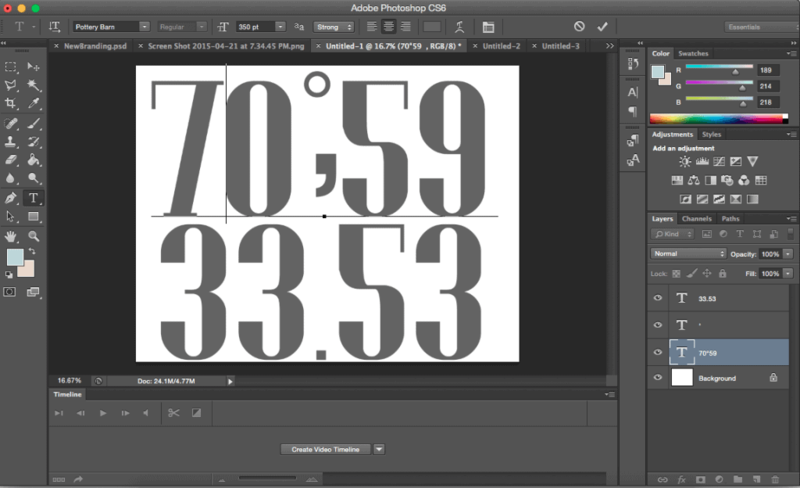 This method was a little bit more time consuming than a stencil, but ultimately still a quick project. I ran out of vinyl to cut my own stencil and wasn’t about to haul a newborn to the craft store in frigid temperatures. I was also going for “free” by using what I had on hand, and I succeeded! We are so happy with how it turned out! 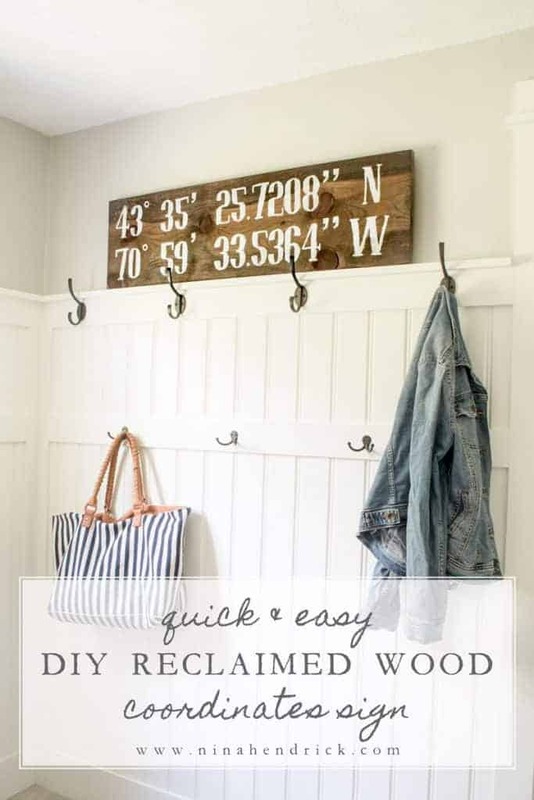 It’s the perfect rustic accent for our mudroom wall with the bonus that it reminds us of a favorite family vacation spot. Now, if only summer could arrive so we can head back there!